Run by the charity Raw Material, Raw Sounds is a programme of music workshops for people accessing mental health services in Brixton. Raw Material’s mission is to improve the lives of young people, their economic position, their opportunities, progression and development, including mental and physical health issues. Raw Sounds reaches people in the community and on hospital wards and seeks to address the issues around social isolation and helps get people to a better place in their lives, to build community and support those coming out of hospital. The workshops aim to help participants move on to engage with mainstream arts programmes, education and employment in the creative industries. Participants of the Raw Sounds programme can attend for as long as they choose. 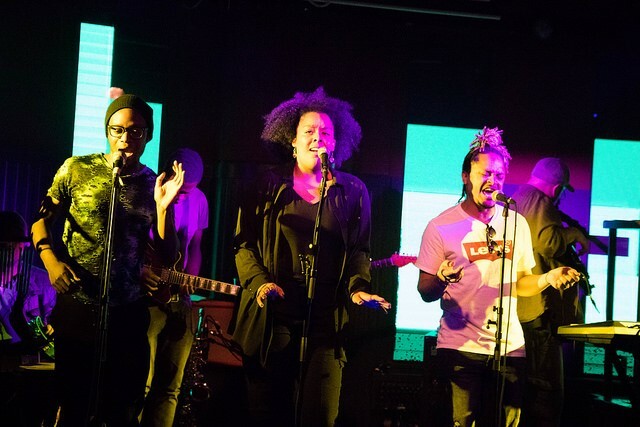 Lead largely by professional musicians, the collaborative music making workshops include live music, studio recording, music production and DJing. The Raw Sounds band will be taking to the stage at Being the Story. The singers and instrumentalists who have all experienced mental health difficulties will be performing a selection of songs and talking about the impact the Raw Sounds programme has had for them. Raw Sounds have performed at Elder Stubbs Festival, Lambeth Country Show and Brixton music venue The Prince of Wales. Raw sounds has been supported by Constructive Voices. Constructive Voices is a Being the Story Partner. Run by the charity Raw Material, Raw Sounds is a programme of music workshops for people accessing mental health services in Brixton. The Raw Sounds band took to the stage at Being the Story. The singers and instrumentalists who have all experienced mental health difficulties performed a selection of songs and talked about the impact the Raw Sounds programme has had. Raw Sounds have performed at Elder Stubbs Festival, Lambeth Country Show and Brixton music venue The Prince of Wales. Raw Sounds has been supported by Constructive Voices. Constructive Voices was a Being the Story Partner.